Payment24 Dealership Fueling System is a lower-cost lighter version of our Fleet Management System specifically designed around Auto Dealerships. Traditionally, dealerships have a set deal in place with the closest Service Station to fill their demo, pre-owned and used vehicles at the forecourt by issuing paper vouchers/slips to the Sales Reps. This loose arrangement makes for a large fraud risk for the Dealership and not much control over the fills. How does Auto Dealership Fuel Management work? Payment24 Dealership System reduces this risk by identifying the Vehicle and Driver at the selected Service Station by using any one of the License Disc, VIN Number, Mobile Number and contactless technologies. These virtual vouchers or credits are sent to the Sales Person’s cell phone, which is used to fill up at your selected Service Station. Alternatively you can give daily/weekly/monthly limits to your Sales Staff who can utilise the limits as per your set rules. We also provide branded NFC Contactless Cards if one wants. In some cases, we negotiate discounted fuel (Petrol and Diesel or both) for you from the Service Station. 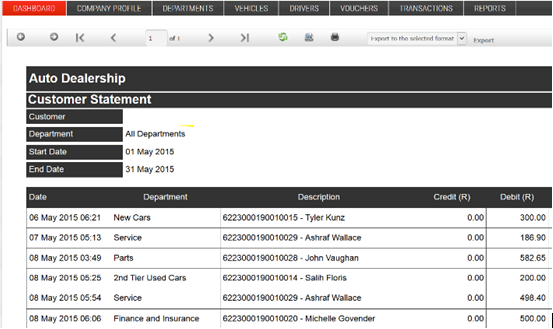 All transactions are authorized BY PAYMENT24 and the Auto Dealership gets real time reports about all the fills. Payment24 Dealership Fuelling System removes the admin and fraud risk from the Auto Dealerships and Service Stations as well. You can choose the transaction settlement between Auto Dealership and the selected Service Station on a daily/weekly/monthly basis. Payment24 Dealership Fuelling System is not a typical traditional fleet system, as it has been adopted specifically for Auto Dealerships. The same system can be used to offer FREE FUEL to your customers on vehicle purchases which is much appreciated by the customers. Auto Dealerships can also run a Loyalty Program for their customers around their Service & Maintenance business using the same system.